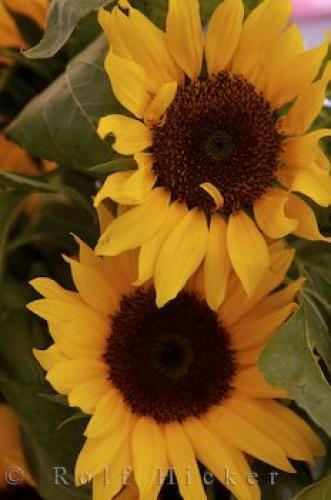 Colourful and cheery, sunflowers can brighten anyone's day. A stroll through the old town markets in the city of Nice and visitors are greeted with colourful and cheery sunflowers and other blooms. Sunflowers are an annual variety of flower which belongs to the family Asteraceae. They can grow up to approximately 3 metres on a tall thick stem and the sunflower head reaches around 30cm in diameter. Seeing a field of these golden beauties is magical especially with the sunflower heads in full bloom and waving in the breeze. Sunflowers at the markets, Cours Saleya in the Old Town of Nice, Provence, Cote d'Azur, France, Europe. markets in old town Nice, Cote d'Azur, France.